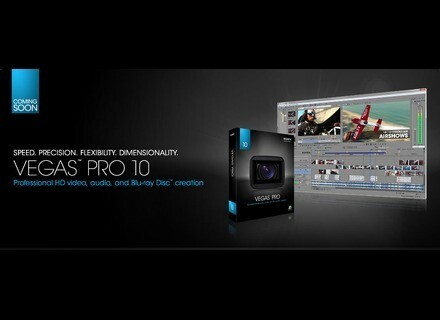 Vegas Pro 10, Video Software from Sony in the Vegas series. Sony Creative Software has announced the imminent availability of Vegas Pro 10.0d. The NLE now includes new closed captioning options, 3D solutions, support for AMD's ATI graphics chipsets using OpenCL as well as an new track group workflow. Vegas Pro 10.0d's enhanced closed captioning support now provides broadcast editors with the ability to read and write closed captioning embedded in MPEG-2, which is designed to enable a unified workflow for EIA-608, EIA-708 and MXF delivery options. Furthering the software's editing functions, Vegas Pro 10.0d incorporates timeline burning to full-frame 3D Blu-ray Discs.D. Vegas Pro 10.0d expands its GPU accelerated AVC encoding support to video editing professionals using AMD ATI graphics chipsets which support OpenCL, the open standard for parallel programming of heterogeneous systems. This new feature is designed to enable faster project rendering when using the Sony AVC encoder. Additional updates include MVC and MPO 3D file format compatibility from Sony cameras including TD10, NX3D1, TD300 and the Alpha and NEX series, providing users with added support for advanced camera and media technologies. GPU Accelerated AVC Encoding Support Expanded to AMD - Adds support for users with AMD ATI graphics chipsets which support OpenCL to use the Sony AVC encoder for project rendering. 3D MVC and MPO File Format Support - Additional native support for emerging MVC and MPO 3D file formats provides continued functionality with camera and media technology (Sony cameras that support these formats include: TD10, NX3D1, TD300, and the Alpha and NEX series). 3D Blu-ray Disc Timeline Burning - New burning capability allows users to burn HD 3D Blu-ray Discs onto BD-R/BD-RE media, providing editors with an ingest, edit and delivery option for 3D media. New Closed Captioning - New closed caption integration allows users to read and write closed captioning embedded within MPEG2 streams, enabling a common workflow for CEA-608, CEA-708 and MXF delivery options. Mixvibes VFX v1.2 MixVibes announces the release of a new update of the VFX digital video mixing solution for Video DJs. Sony Vegas Pro 10.0b Sony Creative Software has updated Vegas Pro to version 10.0b. Adobe Premiere Pro CS5.0.3 Adobe has updated Premiere Pro CS5 to version 5.0.3.